Mazda 6 makes a case for the midsize sedan segment. 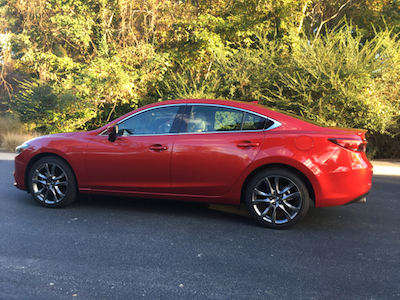 2017.5 Mazda 6 in fast-departing daylight. Manufacturers typically adhere to model years except when they don’t. 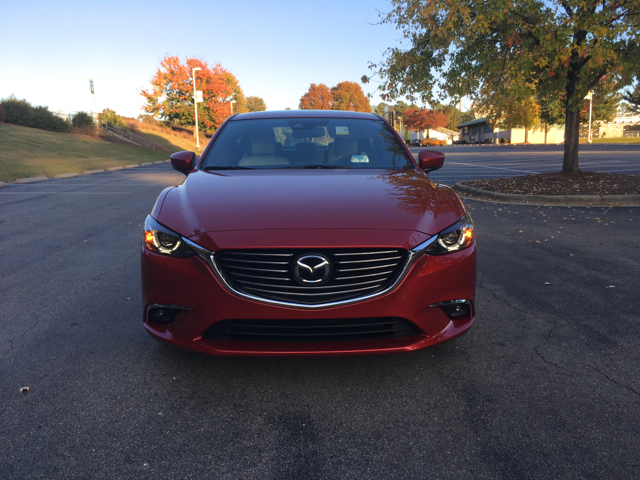 A case in point is the 2017.5 Mazda 6, a midsize sedan benefiting from light changes put in place too late for the 2017 model year, but months before the 2018s arrive. The 2017 Mazda 6 already offered a few changes of note, including a new steering wheel design and an available heated steering wheel, heated rear seats and Nappa leather-trimmed sport seats. Further, Mazda also upped its optional safety features to bring in lane keep assist on the top trim model along with traffic sign recognition. The mid-year changes include blind spot monitoring and rear cross-traffic alert with the base Sport model along with available leather seating surfaces and an 8-way power driver’s seat on the mid-grade Touring model. Could the changes have waited until the 2018s rolled out? Perhaps. But, in an ultra-competitive (and shrinking) segment, Mazda likely realized the changes were timely and prudent. 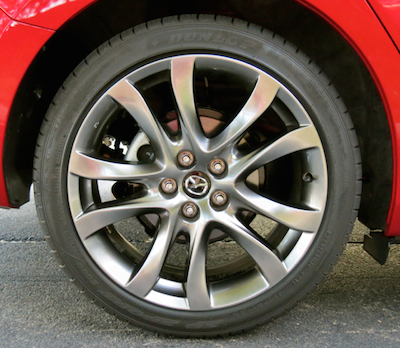 No matter, what you have in the Mazda 6 is a stylish, front-wheel drive midsize sedan with room for five. Available in three trims — Sport ($21,945.$22,995), Touring ($24,195/$25,245) and Grand Touring ($30,695) plus $875 for destination — this Mazda is one of the few models left offering a manual transmission. Thus, the prices reflected here are for the manual followed by the automatic for the first two trims. The Grand Touring offers an automatic transmission only. By the way, the prices for the mid-year model are unchanged from the 2017s. I’ve long admired the 6’s looks, one of the more fashionable models in a segment once dominated by dull, boring sedans. The look could just as easily be applied to a sports car and it is — the Mazda MX-5 Miata offers a similar visage with its gaping grille, athletic shoulders, and sinuous lines. 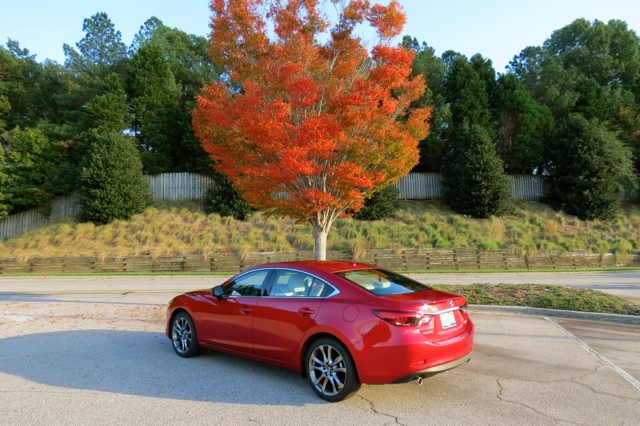 The Mazda 6 stretches that canvas to its proper size and adds a raised rear deck to round out the expression. Standard exterior features include automatic halogen headlights and running lights, LED taillights, power side mirrors, 17-inch aluminum alloy wheels and bright finish dual exhaust outlets. Options include LED lighting, high beam control, adaptive front lighting, LED fog lights, heated side mirrors, rear spoiler, and 19-inch aluminum alloy wheels. Inside, you’ll find a cabin that’s open, well organized, and clean. 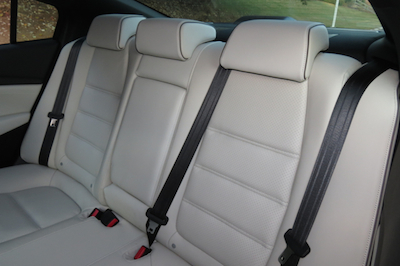 My test Grand Touring model had all the amenities you’ll find in this segment, including white leather seats. The cabin is one of the largest in the segment and you’ll also find a spacious 14.8 cubic-foot trunk. A 60/40 split-fold bench seat extends the storage area. Standard interior features include keyless entry with push-button start, a tilt and telescopic steering columns, power windows and door locks, cruise control, cloth seats, and air conditioning. Options are many and include a heated steering wheel, heated and ventilated front seats, imitation leather seats, power front seats with driver lumbar support, and steering wheel-mounted paddle shifters. 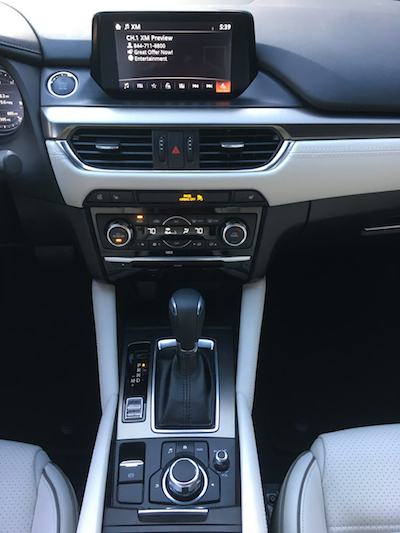 Tech features include a standard 6-speaker audio system, HD Radio, Bluetooth connectivity, USB audio port, and a 7-inch color display. Also available is a Bose 11-speaker audio system, satellite radio, navigation, and a power moonroof. Safety technologies include a rearview camera across the model line along with blind spot monitoring and rear cross-traffic alert. The top-trim Grand Touring brings in such driver-assist features as lane departure warning, lane keep assist, radar cruise control and traffic sign recognition. Speaking of safety, the 2017 Mazda 6 earned a Top Safety Pick+ rating from the Insurance Institute for Highway Safety (IIHS) and a top five star-rating from the National Highway Traffic Safety Administration (NHTSA). You cannot get any better than that! Outside of performance models, acquiring a vehicle with a manual gearbox has become increasingly difficult. The take rate is typically less than five percent (according to what manufacturer representatives have told me) and that means finding manuals is becoming even more difficult challenge than ever. Mazda, however, keeps the 6-speed manual it has long offered with its midsize sedan. It comes standard on the Sport and Touring editions, but is not available on the Grand Touring. All models are powered by a 2.5-liter four-cylinder engine, generating 184 horsepower and 185 pound-feet of torque. These numbers beat the Ford Fusion’s engine of the same size, delivering 175 horsepower and 175 pound-feet of torque, but are under the Toyota Camry’s 2.5L making 203 horsepower and 184 pound-feet of torque. 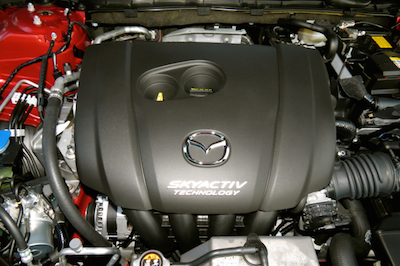 The Mazda 6 earns an EPA-estimated 26 mpg in the city and 35 mpg on the highway for a combined 29 mpg. Across my 233.5-mile journey, I earned exactly 28 mpg for about 80 percent highway driving. I was a bit disappointed to fall short of 30 mpg, especially with cruise control used extensively on the open road. There are very few six-cylinder engines left in the segment. The Subaru Legacy still offers a 3.6-liter inline-six, the Toyota Camry can be had with a 3.5-liter V6, while Ford offers the most powerful engine in the segment, a 2.7-liter turbocharged V6 making 325 horsepower. As for Mazda, you have the one engine and nothing else. Chances are, most people will be happy with it. That said, the engine is loud and nothing like the lusty roar of a V8. More of a whiny clamor when you’re pressing the pedal to the metal. That’s also par for the four-cylinder course — some manufacturers do a better job of disguising the buzz through sound-deadening materials or white noise. But there are several strong suits present, including a sporty ride and active steering. Quite noticeable is the G-Vectoring Control system, what keeps the sedan fixed and stabilized under hard acceleration. Torque steer? None detected. 2), They’re more cost effective. Indeed, with the second point it is fairly easy to find a well-equipped model for $25,000, typically after claiming whatever discounts are available. 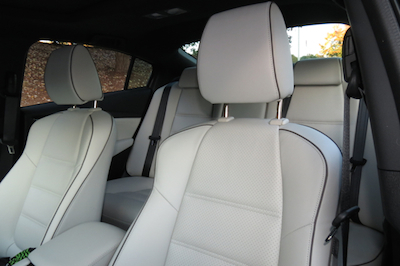 Choose the Grand Touring and you’ll pay quite a bit more, but you’ll enjoy an upscale interior. Premium features are present, including an available power moonroof and a nifty head-up display screen that emerges from the top of the dash.